The Pan of Hamgee isn’t paranoid. There must be some people in K’Barth who aren’t out to get him. Unfortunately, right now, he’s not sure where they are. His family are dead, and his existence is treason. To survive he does the only thing he can to survive – getaway driving. 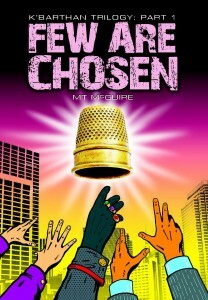 As if being on the run isn’t bad enough, he finds a magic thimble. He decides to keep it which can only mean trouble. Sure enough, it does. 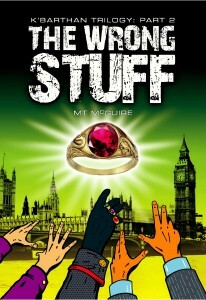 He unwittingly sets himself on a collision course with Lord Vernon, K’Barth’s despot ruler. Unwillingly, The Pan is forced to make choices and stand up for his beliefs. It’s a challenge, since previously he had no beliefs he was aware of. Faced with a stark moral dilemma, he realises his new found integrity might even stick… if he can stop running. The Paperback of Few Are Chosen can be purchased from any online retailers and most decent book shops. Every format you care to name from Smashwords HereScrewpulp, epub, pdf and mobi here. To save her life The Pan must introduce Ruth, the woman of his dreams, to the person prophesied to be the man of hers. And he knows he must do it fast. Before Lord Vernon finds her. But the gentleman in question is in hiding and no-one knows where. Only The Pan can find him. If he can bring himself to unite them. 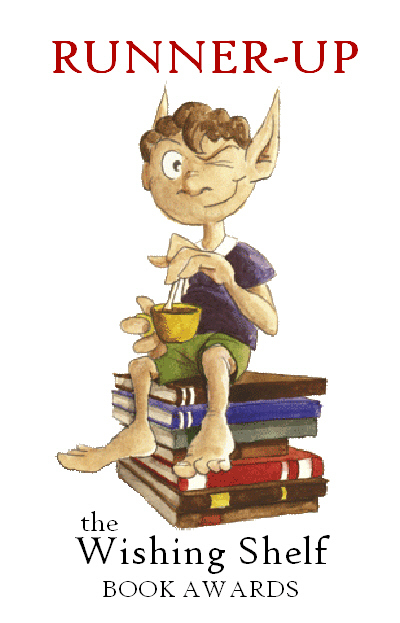 Every format you care to name, and probably some you don’t Smashwords – Here. 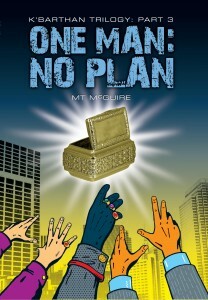 Coming soon… One Man: No Plan, K’Barthan Trilogy: Part 3. The Pan of Hamgee has a chance to go straight, but it’s been so long that he’s almost forgotten how. With a death warrant over his head he is released, given a State sponsored business, and a year’s amnesty for all misdemeanours while he adjusts. He doesn’t have a year, though. In only five days Lord Vernon gains total power. Unless The Pan can stop him, K’Barth is doomed. The future hangs by a thread, and the only person who can fix it is The Pan: a man without a plan. 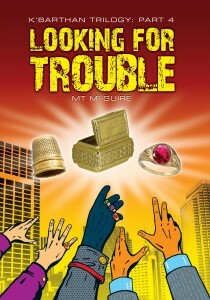 Coming soon… Looking For Trouble: Part 4 of the inappropriately named K’Barthan Trilogy. The time has finally come when The Pan must stand up and be counted. He must face his demons and rectify the chaos he has caused. He can stop Lord Vernon, and he’s going to, but the timing is crucial. To succeed he has to stay alive, a possibility if he keeps his head down and maintains a low profile. But that’s not an easy task for The Pan.